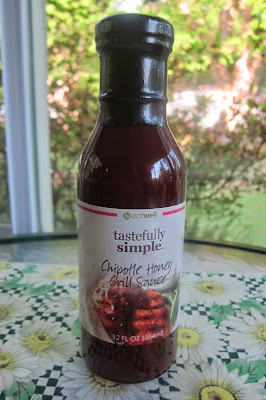 I've been using Tastefully Simple products for quite some time now, so I was looking forward to trying out the new Chipotle Honey barbecue sauce. The sauce smelled great when I opened the bottle. I picked up the honey smell right off the bat. I decided to grill pork chops with the Tastefully Simple BBQ sauce. We've been doing pork chops quite a bit lately with some good sales in this area. 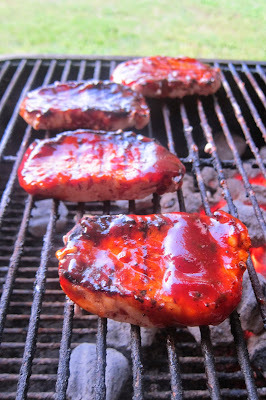 If you tend to dry your pork chops out, check out my tips for grilling boneless pork chops. The pork chops grilled quickly. Above you'll see them the last couple of minutes while the barbecue sauce "sets." I grilled these when my older son was home, since the younger son does not like much heat (but he does love honey). The Chipotle note was there but just a hint. The honey was the stronger flavor. The balance was very nice. This is a barbecue sauce that you could serve to any group. I plan to grill something for my younger son with the Tastefully Simple barbecue sauce, because I'm sure he'll love the honey flavor, and the peppers are not hot enough to put my mild guy off. * Tastefully Simple did send the product free in exchange for an honest review. Regular readers will know I am one to say what I think. We will be having our grill party this Saturday and I'm going to try the Chipotle Honey barbecue sauce you suggest. I'm sure my family will love the honey flavor barbecue.